The model - New World First Bus announced on 20th June 2000 they were to issue two models of the Leyland Short Fleetline, or SF, as part of their 'Heritage Collection' series. They were decorated in the two special 'Peak' route liveries. 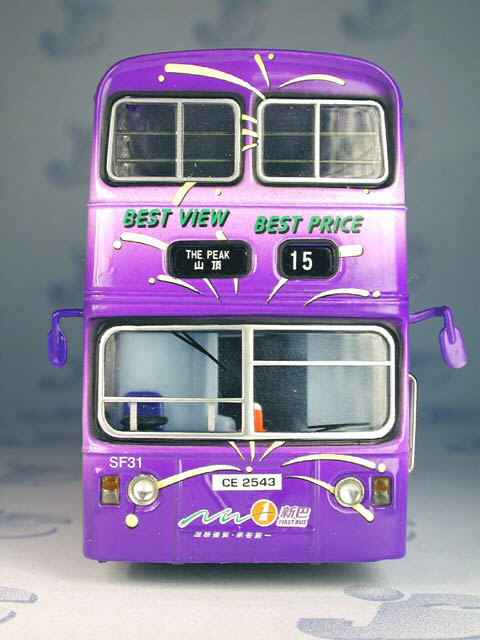 The model was actually issued after the real bus had been withdrawn from service. 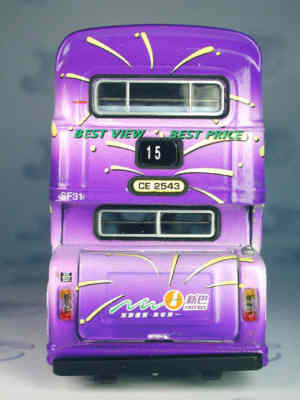 The bus - New World First Bus decorated two of their SF's in special liveries advertising route 15 to The Peak. 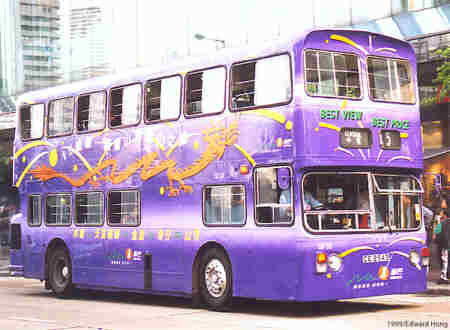 The first carried the green and orange livery (20002) and the second, featured here, carries the all over purple livery. 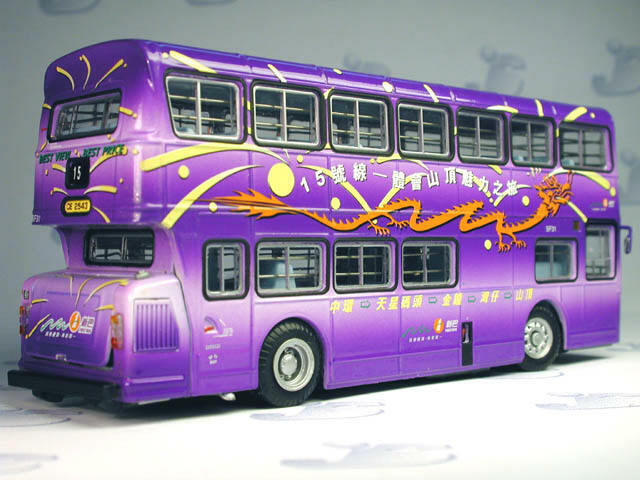 In 1978 China Motor Bus announced that the final 30 chassis of an order of 70 Long Fleetlines had been changed to 31ft vehicles. Alexander bodies similar to those fitted to the LF class were used, the most recognisable difference being the SF had a half width rearmost nearside window whilst the LF had a full width. This would allow them to be used on routes 15 to The Peak and 6 to Stanley, where road conditions required shorter vehicles. SF31 entered service in April 1980. 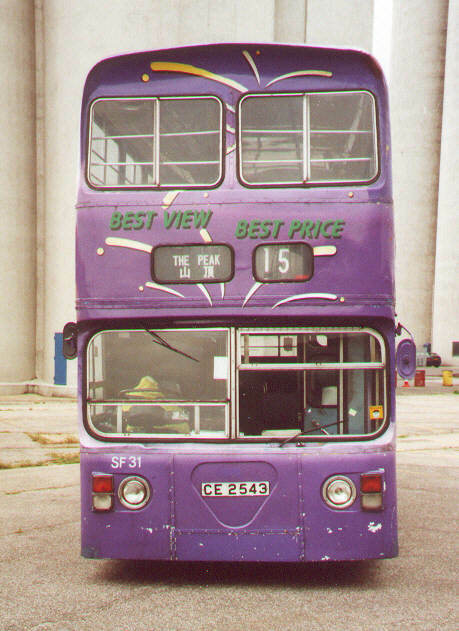 SF31 is now preserved and details of it's life after being withdrawn can be found below. Prototype chassis Leyland Fleetline FE31AGR "SF"
SF31 entered service on 1st April 1980. 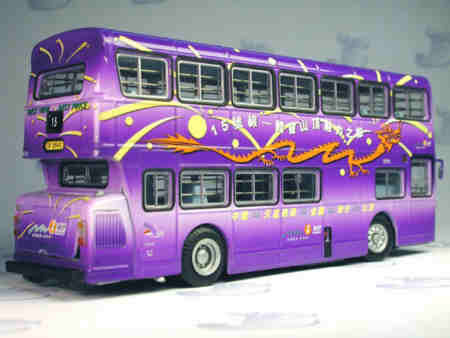 It is, numerically, the last of the 336 Daimler or Leyland Fleetlines purchased new by China Motor Bus. At that time it was fitted with push-out hopper front, upstairs windows and had a steel, front bumper fitted. It also had fully-automatic gears. As it progressed through the years it lost each of these features. The hopper windows were replaced by full depth sliding windows, the steel front bumper was removed and the gearbox was converted to semi-automatic configuration. SF31 passed to New World First Bus on 1st September 1998 and remained in CMB livery, except that New World First Bus stickers were placed over the CMB fleetnames and the CMB logos on the lower panels were painted over. SF31 remained rostered to Route 15 for the most part, although it could also be found on 88. During 1999 SF31 was repainted into advertising livery for Route 15 to The Peak along with sister SF8. SF8 differed by having green panels below the level of the dragon’s body, with white and orange above the dragon. 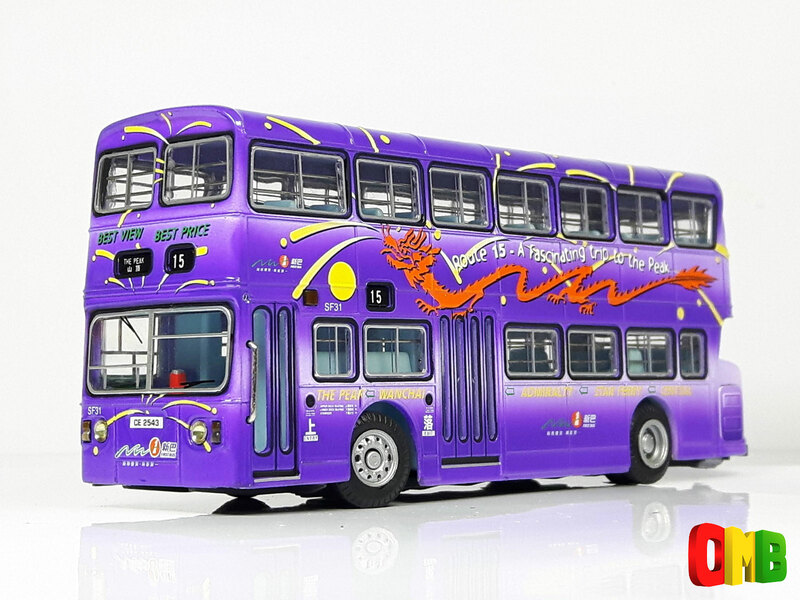 Both buses had the dragon shaped to form the same ‘nw’ waves motif that the first 80 Alexander Tridents carried. The treatment of the ‘nw’ on the Fleetlines is more subtle than that on the Tridents, so is less easily noticed unless viewed side-on. SF31 has now been made available in model form in a special ‘heritage gift set’ along with SF8. 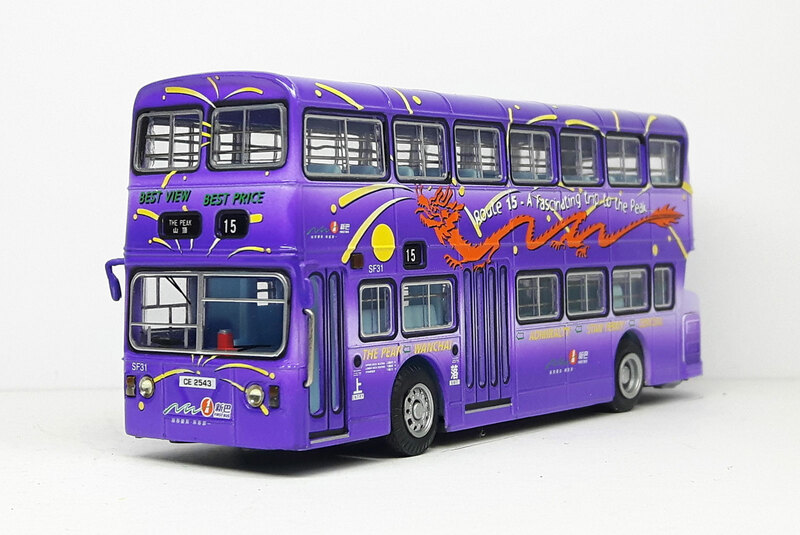 These have been specially commissioned by New World First Bus, from whom the gift set is available. SF31 was withdrawn from service on 2nd May 2000 and boarded the M V Madame Butterfly of Wallenius Wilhelmsen on 12th May. It spent 7 weeks and four days at sea until arriving at Southampton Docks on Tuesday, 4th July 2000. 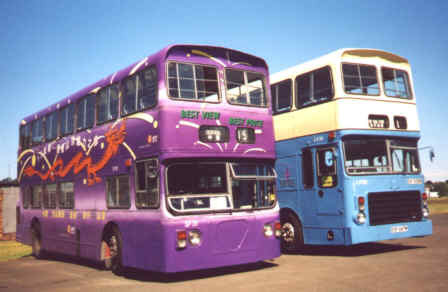 On the voyage SF31 was kept company by one 12 metre Dennis Condor 3-axle (DL45); eighteen 12m Metrobuses (ML-class) and four 11m Leyland Olympians (LM3, 5, 8 & 9). The MLs were for EnsignBus and the LMs for First PMT. SF31 was collected on the Friday morning and almost started first time. After ‘jumping’ the battery from the 24-volt batteries brought in the boot of the hired support car, it started straightaway. SF31 left Southampton at 1pm. In order to ensure that the bus had sufficient rest on its 480-mile (768 km) journey, it was driven for no more than 2 hours at a stretch then was given an hour’s rest. After 22 hours, SF31 arrived at Alexanders in Falkirk at 11am on Saturday, 8th July. It was parked out of sight until the following day when it started the final leg of its journey to the Scottish Vintage Bus Museum near Dunfermline where it arrived at 2pm on Sunday 9th July. During the journey of 480 miles, SF31 used 190 litres of fuel and took half a gallon of engine oil. No water was needed during the journey, despite the water filler cap being missing. To date, various panels have been repainted to get rid of the marks where the paint has peeled off. The ultimate plan is to repaint it in its existing livery.